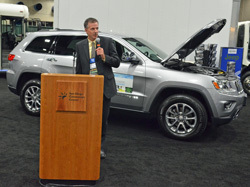 Chrysler featured their new B20-approved 2014 Jeep Grand Cherokee diesel during the Vehicle Showcase. It’s equipped with a 3.0L EcoDiesel engine and boasting a best-in-class highway fuel economy rating of up to 30 mpg, running over 730 miles on one tank of fuel. Chrysler/Jeep’s, Brad Beauchamp is the Vocational Account Executive for the Energy Segment of the Chrysler Group LLC. He spoke on behalf of the company and shared his excitement to see diesels coming back into the marketplace.